We have partnered with XTERRA Wetsuits to bring you some killer discounts! Click on the logo below to see the deals and then sign up on our Facebook page to get the discount code. 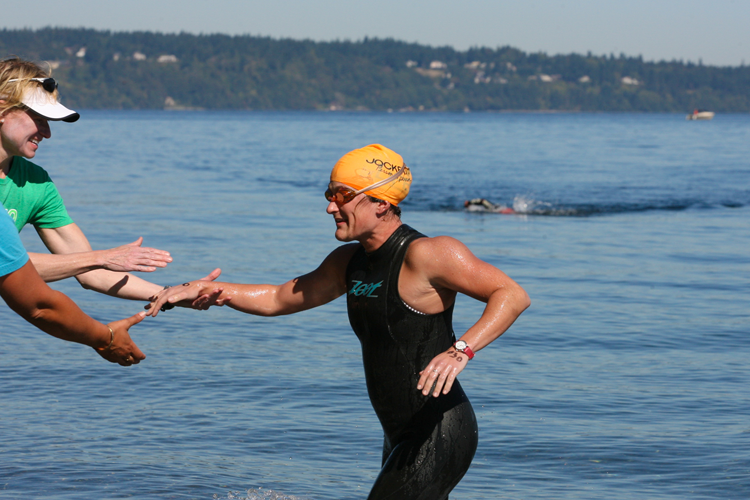 This 5K / 3.1 mile swim is NOT for beginner swimmers. An open water pace of ~2:25 per 100m (about 1.24 mph) is required to make the 2 hour cut-off time. NEW THIS YEAR IS EVIDENCE OF A 37:30/1500 meter pool swim OR a 41:15/1650 yard pool swim OR 50 minute/1 mile open water course WILL BE REQUIRED as part of the online entry form. The 7:30 am 5K swim starts just before the 7:59 am peak of high tide. Currents should be at their strongest at ~0.75 knots(~0.94 mph) and will push you toward Gig Harbor [Figure 1]. You will need to angle your swim EAST - to your right (toward Port of Tacoma) to counter the current. We hope to have a 50-foot banner, elevated 40 feet in the air above the beach, on Vashon to help guide you to the two 5 ft yellow cylindrical turn buoys. If you are at Vashon Island at 8:00 am, the current closest to the shore current may be moving toward Tacoma and taking you to both turn around buoys [Figure 2]. At 9:00 am, on the way back to the large yellow inflatable finish arch at Owen Beach, the current is expected to ba at slack, so expect water conditions to be like a washing machine [Figure 3]. The swimmers near the 2 hour / 9:30 am cut-off on the way to Owen Beah, will now notice the current in the middle of the channel moving eastward toward Port of Tacoma [Figure 4]. The currents close to the shore, about 200 yards from the large yellow inflatable finish arch at Point Defiance, should not be significantly notable yet, but may sweep you back west / to your right toward Gig Harbor. If that happens, swim with the current, angling your exit to the beach and get out where and when you can, and walk to the finish. Be sure to check in with the finish line officials and turn in your ankle chip. 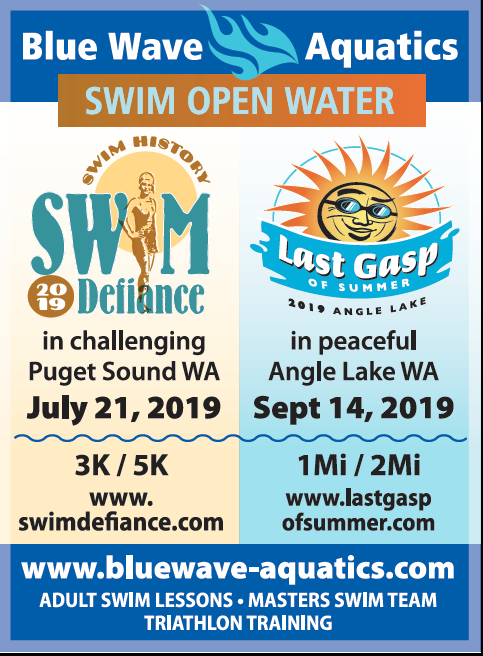 It is strongly recommended that this 3K / 1.8 mile swim NOT be your FIRST open water swim. An open water pace of 3 minutes per 100 m (~0.75 mph) is required to make the NEW 90 minute / 1.5 hour cut-off time. The 8:00 am 3K start will have a slight westward current of ~.025 knots at the start of the crossing [Figure 2]. In the next hour, the westward currents are expected to diminish as we reach slack tide at 9:00 am [Figure 3]. After one hour, the swimmers past the middle of the channel should expect water conditions to be like a washing machine [Figure 3]. The swimmers still swimming near the 90 minute / 9:30 am cut-off on the way to Owen Beach, will now notice the current in the middle of the channel moving eastward toward Port of Tacoma [Figure 4]. The currents closer to the shore, about 200 yards from the large yellow infltable finish arch at Point Defiance, should not be significantly notable yet, but may sweep you back west / to your right toward Gig Harbor. If that happens, swim with the current, angling your exit to the beach and get out where and when you can, and walk to the finish. Be sure to check in with the finish line officials and turn in your ankle chip. Logo Design by Mary Ann White.